Beginning October 1, 2018, those looking to become registered as a securities industry professional will have to pass the FINRA Securities Industry Essentials exam (SIE). Any individual age 18 or older is eligible to take the SIE exam. There is no requirement to be sponsored by a broker-dealer. 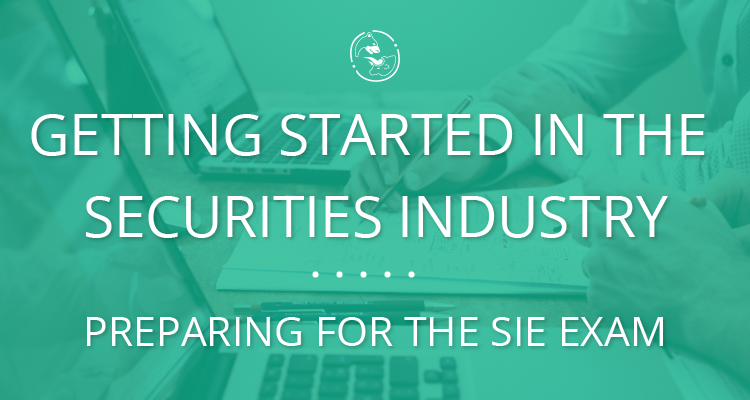 The SIE is an introductory-level exam that tests candidate’s knowledge on basic securities industry concepts. The SIE exam is a corequisite to all representative-level exams—which have been restructured by FINRA. Passing the SIE does not qualify a person for registration with FINRA or to be engaged in the securities industry. The Content Outline for the SIE exam can be found at www.finra.org/industry/essentials-exam. To prepare for the SIE, and all future securities exams, you should take a preparation course. A.D. Banker & Company offers online courses, web classes, practice exams, and self-study books for the SIE, Series 6, Series 63, and Series 65 exams. You can view the educational packages that we have available under the Exam Prep menu of our website, www.adbanker.com. There is no requirement for individuals to be sponsored to take the SIE exam. To schedule your exam, you must access the enrollment system from finra.org. You will need to create an account to enroll and must pay for the exam at that time. The fee for the exam is $60 and can be paid by credit card or redeeming a voucher. From the enrollment page you will access a direct link to the Prometric appointment scheduling page. You may view the FINRA Tutorial for taking Qualification Exams prior to taking your exam. Plan to arrive 30 minutes before your appointment time to allow time for check-in procedures. If a seat is available, you may be allowed to begin your exam early. You will not be allowed to test if you arrive later than 30 minutes after your appointment start time, and a seat is unavailable to accommodate your full testing time. If you are not permitted to test due to your late arrival, FINRA will charge your firm a late cancellation fee. If you are not sponsored by a firm, you will be required to pay for a new test enrollment to reschedule your exam. You will be required to provide a government-issued photo ID with a signature to be admitted to the exam, such as an unexpired driver’s license, military ID, or passport. All other personal items must be placed in a locker while testing. You will be required to sign the center’s sign-in log and agree to abide by the FINRA Exam Center Rules of Conduct and the Testing Center Security Guidelines. The testing center will provide you with a four-function calculator, and 2 dry-erase boards and pens. For more information on what to expect at the testing, visit the following Prometric web page: https://www.prometric.com/en-us/for-test-takers/prepare-for-test-day/pages/what-to-expect.aspx. Once you have completed your exam, you will receive a printout of the score report as you sign out with the testing center. Upon passing, your results will show the word PASS, and not include the score. If unsuccessful, the score report will show the actual score. You can also view the results in the enrollment system. SIE exam results are valid for four years. Read each question twice before looking at the answer choices. Reading carefully is key in making sure you understand exactly what the question is asking. Look at all answer choices, the exam is looking for the BEST answer, the most complete fit. Questions written with double negatives can be challenging, for example, "all are true except." This question is looking for the false answer. Take your time to make sure you know if the question is looking for a true or false answer. When questions ask you to put items in sequential order, pay attention to the order asked. One word can make a difference in the correct answer. Watch for words like: all, none, never, if, except. If you have a question that seems completely foreign to you, it’s likely that you can still answer the question if you have completed the study program. If you don’t recognize a term, use your common sense and knowledge of the English language to help understand what the question is asking. Don’t “add” anything to the question. If an answer choice requires a qualifier to be correct, and the question did not include the qualifier, that is not the best answer. If you are torn between two answers, and you feel comfortable that one choice fits, and the other choice "CAN fit, IF…," that is not the best answer. Don't try to make the answer fit.